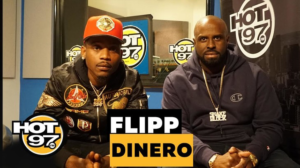 10.12.18 | No Comments | Tom G.
Flipp Dinero had some fire for us on #freestyle109. He’s from Brooklyn, New York. He went in on the classic ‘Dead Presidents’ Jay-Z beat. I can’t lie, I was sleepin’ on him until I caught this, but i’m a fan. Check it out.